This illustration shows a 3D molecular model (based on cryo-electron microscopy (cryo-EM) studies) of a CRISPR complex (Csy) binding to foreign DNA (orange). It splits the two strands of DNA apart in order to prepare the DNA for degradation, thus protecting the bacterial cell from infection. 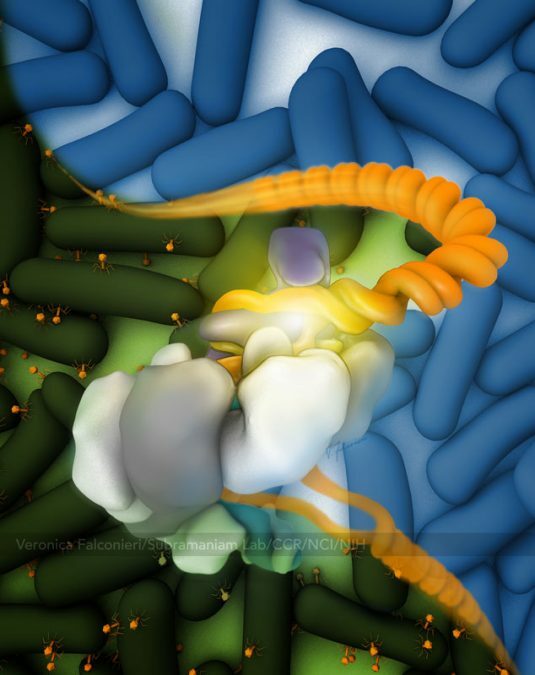 This can mean the difference between death and survival for the bacteria (background). Image featured in Nature and the Center for Cancer Research News.